The UK-Racketball Series started in 2010 with 5 events. The Series has now grown to 8 events that are now running at some of the best squash and racketball venues in the UK. The aim of the UK-Racketball Series was to provide a place for all racketball players to come and compete. These are not just tournaments for the countries best players (although in the A grade this year will once again see the very best players competing) but for all racketball players. We are very proud of the atmosphere at these events which are very relaxed off court and then quite intense on. We stress that sportsmanship comes first and have tried to create a community of players. The types of people playing our events varies from the very young to very old. Girls, boys, men, ladies, people who have only started to play racketball last weeks to ex professional squash players. If you are ever unsure if you are good enough to enter a UK Racketball event a good place to check out is our Facebook page where we have plenty of photos and our racketballer following who will undoubtedly be able to help you out! Alternatively email us at info@uk-racketball.com and we will be more than happy to advise you. Click here to get to our Facebook page. If you want to play the UK-Racketball Series you have two choices. You can either sign up to an individual tournament or you can become a member and play all the events that you choose. During last year’s Series about 1/3 of all players who took part were members. UK-Racketball are delighted to announce that HEAD will take over the title sponsorship of the UK-Racketball Series in 2013. Head cater for several sports, including racketball, providing everything from rackets, bags, balls, string and footwear. A selection of top of the range HEAD racketball rackets and bags will be up for grabs for the lucky winners of each grade at all events in this year’s UKRB Series. "HEAD are very excited to be announced as the official sponsor of the UK Racketball league for 2013/14. “Racketball's popularity has grown significantly over the past few years here in the UK and as a leading brand in racketball products, we felt that the timing was right to work with the UK's only recognised racketball league." "I'm thrilled about the partnership between HEAD and UK-Racketball for the 2013/14 season. “They are such a well-respected and popular brand in the squash and racketball world that to be working with them this year is an honour. We are lucky to be once again running the Series at some of the UK’s most prestigious clubs. For more of the information on each of the below events and for online entry follow the links. We welcome on board a new club, Leamington Lawn Tennis and Squash Club. We always look to hold venues at the best clubs in the country and this is no exception. 5 squash courts including a really nice show court and a newly renovated changing area and bar, we are sure that Leamington will prove to be a popular addition to the Series. We held a survey at the end of 2012 to ask the participants how they thought we could make the Series better. “Add an over 60’s category” came back as the number one suggestion. This has now been included and we hope that it will prove as successful as the other age group categories have in the past, the Over 40’s and 50’s.. The tournaments will be 1 day events to help as many people as possible be able to play. We will always ensure that every competitor has at least three, best of three, matches. Scoring will be American to 11 and best of 3 games. The tournament structure will depend completely upon the number of entries but we like to run group stages that lead into a knockout whenever possible. All balls used will be as specified by England Squash and Racketball for the past three years we have used Price Blue and Price Black balls and will continue to do so for 2013. All balls used will be as specified by England Squash and Racketball at the National Championships, unless stated otherwise. It is important to remember that UK-Racketball Series events are designed to be inclusive. Although the A grade does attract the best racketball players in the country the events really are for players of all ages and abilities. We have never had a competitor who felt they were not good enough for an event when they took part and we often have people who have never played a tournament before having a really enjoyable day. B Grade – Play the game regularly at your club but not against other clubs in the top county league. The difference between the A and B grades tends to be that B grade competitors are used to playing other players from their club whereas A grade players tend to be the players who play against players from other clubs in the local league or for the county. Beginner – This is for players who have recently started racketball. 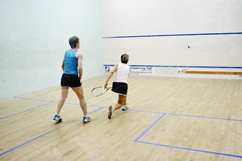 Players who have previously played squash to a high level and have now started playing racketball may be better off in the A or B grade. To maintain a fun atmosphere for this grade, only trophies will be awarded to the winners however there will also be a reduced entry fee of just £10. This really is for players that are new to the game and new to the squash court. If you are unsure which category to enter please feel free to contact Mark Fuller directly on 07846067505 or email mark@starsportsdevelopment.com and he will be happy to advise you. The UK-Racketball Series has come a long way since 2010. Follow the links below to see what happened in previous years. All matches in the UK-Racketball Series count towards your National and Series Ranking. Follow this link to see how the rankings are calculated. The Series champion at the end of the season will receive UK-Racketball winners hoodies as shown adjacent. Would you like to sponsor the UK-Racketball Series? Last year we ran events at 8 of the most prestigious squash clubs in the country with over 600 people taking part and playing over 1000 matches. If your company would like to become a part of the Series contact Mark Fuller directly on 07846067505 or mark@starsportsdevelopment.com we have packages starting from £100.00 (inc. VAT). We have strived to put together packages that will not only bring exposure to your business but directly drive sales. All money raised will be put directly towards the UK-Racketball Series. Need more information or have any questions about the UK-Racketball Series? Any questions about the Series?